I have worked 9 seasons. I worked for two companies. I worked for Bostock in 2008 to 2011 and then I came to work for Pick Hawke’s Bay in 2012 to 2018. I heard about the RSE scheme and I wanted to join the scheme, so I went to the Girl Guide hall for recruitment. I was in the first group of RSE workers from the Solomon Islands. Our group was five women and five men. We came to New Zealand to work for Bostock in 2008 . When I told my family, they were very happy that I got chosen. 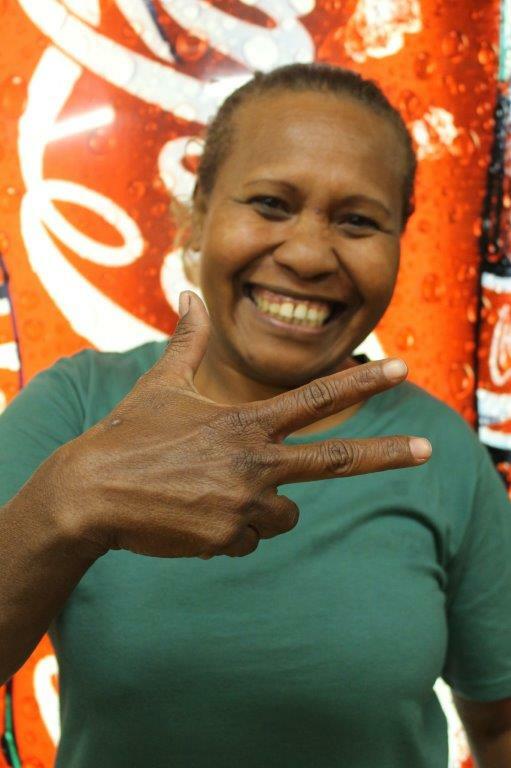 Then in 2012 this agent called Cathy came to the Solomon Islands to recruit workers for the RSE scheme. I wanted to shift to another company for a different experience. I asked Cathy and she said, ‘ok, come and sign some documents’. That is when I came to work for Pick Hawke’s Bay. It was my first time to NZ and I was scared, this was when I worked for Bostock. We stayed in Ramsey street in Flaxmere. That time we had no transport, so we had to walk everywhere. We would walk to work then back home and to the supermarket and back home carrying all our shopping. Those days, it was so cold working in the Bostock pack house, I wasn’t used to the cold. I understood what work we had to do because the QC (quality control) explained the work really well to us. The first time was hard because I was not used to that kind of job and the cold made it so difficult to work. It took me, maybe, about a month until I got used to the work. My work at that time was mainly packing squash and sometimes onions. Also I would select and sort out the good squash from the bad ones. When I came to work for Pick Hawke’s Bay they put me with Gourmet Blueberries. I was very slow in the beginning. It took me about two months to really get used to picking the blueberries. It is good exercise. How did you adapt to the Western way of life? Were there any challenges? When I first came here my English was very bad and I was too shy to talk to New Zealanders. Also, I didn’t know or understand the western food but I would still try it. Some of the food was too rich in flavour and too expensive and the water gave me a shock because we are not used to cold water at home. The cold water here is very, very cold. I remember we didn’t know where Hastings town was so we tried to find it by walking from Flaxmere. We got lost so we thought we can catch the taxi back home but we didn’t know how to do this so we kept on walking and soon we found our way home. One time when I caught the bus, I didn’t know how to stop the bus, the bus just kept going. I didn’t know the streets and where to get off. The roads and houses all looked the same. I had to get off the bus at a different street and I walked a long way to find my way home. Now, I can find my way around Hastings and I’m very used to the New Zealand way. For the first season my plan was to build a house. It took three seasons to complete my house. Then there was a flood that destroyed everything, my house and everything inside my house. I was here in NZ at that time working for Pick Hawkes Bay. I went home to nothing and I had to stay with my sister. So, my plan was to build another house. I started to buy timbers and roofing in Solomon Islands with the money I made here. In 2015, I started the actual build to put up the roofing. Then I returned back to New Zealand to work. Then in 2016 I completed my second home and I bought all the furniture and homeware. This season my plan was to buy a car. I would send money back home to my partner who purchased the car this year in February. I want to build a house for renting with three bedrooms, kitchen, bathroom, toilet and lounge room. I plan to build in town, in Honiara. I think it will take me 3 seasons to complete. I would like tourists to rent this new house. I also want to build a village stay. I will build little huts and charge cheaper rent. People can come spend the weekend like a holiday house. I have to work hard, earn and save to make this happen. The RSE scheme is really helpful. It helps me to sponsor my sister’s children for school, all five of them. I have sponsored their education since I started work in New Zealand and now I am still their sponsor. I helped fund the water supply in my village. Our village and church came together and we did community work to build our water supply. It is still working now, we just built it last year. Sometimes I have no money for myself because I help a lot for my family and village. The RSE scheme has given me lots of experience and support. It has really helped me to earn good money to build two houses, help for my family and village and also to buy a car. Thank you to RSE and thank you to PHB that I am still coming here to work for RSE. Thank you to Anthony for having me back every season.